IP block rules can be created to block network traffic originating from certain source IP addresses or network addresses. IP block rules are primarily intended to block hostile hosts from the external network, however, it is sometimes useful to use this feature to block internal hosts, for example, if an internal system has been infected by malware. IP block rules can also operate in an exception mode – allowing traffic from certain source IPs or network addresses to always be allowed. 1. Go to the Network > Filtering > IP block page. • Source IP or network — Enter the source IP (for an individual network host), IP address range (for example, 192.168.10.1-192.168.10.15), or subnet range of IP addresses (for example, 192.168.10.0/255.255.255.0 or 192.168.10.0/24) to block or exempt. 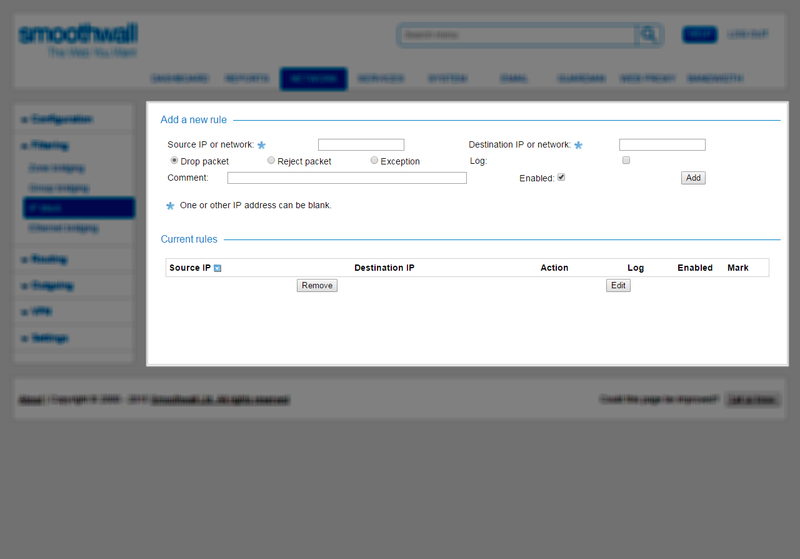 • Destination IP or network — Enter the source IP, IP address range, or subnet range of IP addresses to block or exempt. • Drop packet — Select to ignore any request from the source IP or network. The effect is similar to disconnecting the appropriate interface from the network. • Reject packet — Select to cause an ICMP Connection Refused message to be sent back to the originating IP, and no communication will be possible. • Exception — Select to always allow the source IPs specified in the Source IP or Network field to communicate, regardless of all other IP block rules. Exception block rules are typically used in conjunction with other IP block rules, for example, where one IP block rule drops traffic from a subnet range of IP addresses, and another IP block rule creates exception IP addresses against it. • Log — Select to log all activity from this IP. • Enabled — New IP block rules are enabled by default. Clear the check box to create a disabled rule. Note: It is not possible for an IP block rule to drop or reject traffic between network hosts that share the same subnet. Such traffic is not routed via the firewall, and therefore cannot be blocked by it. 1. Go to Network > Filtering > IP block. 4. Edit the configuration as required. For a detailed description of each setting, see Blocking by IP Addresses .